A classy, touching, South Asian flavour to the Beauty and the Beast fairy tale. ‘She Loves Me, He Loves Me Not’ by Zeenat Mahal is a heart-breaking romance between two unforgettable, lovable characters, splendid in the backdrop of joint family and its traditional values. The story makes one believe that beauty, really, is skin-deep, and it’s the inner strength and core values, which have the power to win true love. Fardeen, the gorgeous, how I hated-loved-hated him, then finally fell in love, as he tries to win Zoella over. Zeenat has managed to express his insecurities, vulnerability and confusion admirably. As one gets drawn into the story, one empathizes with both Zoella and Fardeen, at times gets exasperated with Fardeen’s blunders, their quarrels and misinterpretations. In all this passionate mayhem, Zeenat Mahal’s entertaining brand of humor can be seen throughout the book. The secondary characters both Swaba and Salaar suit the story to the T (did I mention that all the names chosen by Zeenat are lovely). Swaba is a perfect friend and a no-nonsense sister. I loved Salaar and the support he gives to Zoella, bringing some light-hearted moments in the story. Is Zoella able find the happiness and love, which all girls dream of, with their hero? Or is there a beast in the garb of Prince Charming? How will her love for Fardeen stand the test of time and his scorn? Or is she fighting a losing battle. 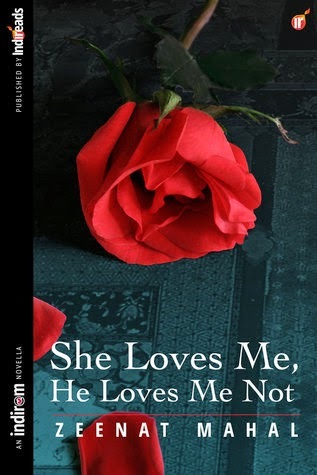 To find out read Zeenat Mahal’s latest offering ‘She Loves Me, He Loves Me Not’. Zeenat Mahal (@zeenat_mahal) is an avid reader and has been writing for as long as she can remember. She has an MPhil in English literature from Government College Lahore and is currently doing an MFA in creative writing from Kingston University, London. She won a BBC short story competition in 2001 and has been a regular contributor to newspapers.